Hully Gully of London, Ontario has been turning dreams into reality for over 40 years. Hully Gully is London’s Full Line Cobalt Boats Dealer, Bayliner Boats, Trophy Boats, Princecraft fishing boats, Yamaha ATV, Motorcycle, Waverunner, Sport Boat, Generator and Snowblowers & Suzuki Motorcycle, ATV Dealership. Hully Gully specializes in making sure the customer understands how their new “Toy” works and have a knowledgeable Parts & Service Team to answer any questions along the way. Hully Gully is proud to announce the return of Honda Powersports! We are now your Full Line Honda Motorcycle, ATV, Outboard, Snowblower, Generator and Lawnmower Dealership. 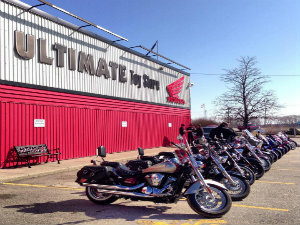 Hully Gully also has the best selection of used ATV’s, used Boats & used Motorcycles in South West Ontario. Whether you are looking for a pre-owned Honda Motorcycle or a pre-owned Sea Ray Cruiser, Hully Gully has the selection to find you the right toy for the right price.